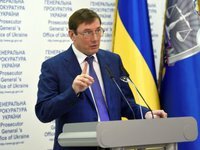 Prosecutor General of Ukraine Yuriy Lutsenko is waiting for the final conclusions of examinations to make hard-hitting steps against businessman Dmytro Firtash, who has been waiting for extradition to the United States in Austria for the fifth year, and his enterprises in Ukraine in coming months. "In the coming months, Mr. Firtash will receive good messages for us from the prosecutor's office. This will concern regional gas supply companies, chemical plants and enterprises in the temporarily occupied territory," he told reporters in Kyiv on Wednesday. "Frankly speaking, I am waiting for the final conclusions of the examinations. As soon as they arrive, suspects will be announced, arrests and other hard-hitting actions will be made," the prosecutor general said. According to him, the arrogance with which Firtash appeals to Moscow with the demand to punish Ukraine has passed any limits. "And this means that this case lies in my pile, closest to my right hand," Lutsenko said. He said that the prosecutor's office had repeatedly tried to prevent the supply of Ukrainian raw materials to Firtash's enterprises in Crimea, but the courts, which systematically remove arrests from fields, interfere with this in practice. "Periodically we get such decisions. We start everything again: we impose arrests again, cancel them again... This is quite a routine work," the prosecutor general said.